The Mercury Monument stands outside of Complex 14. 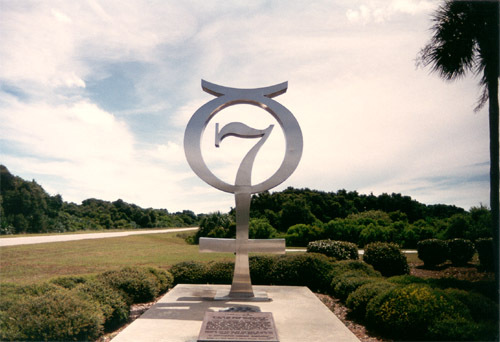 The monument shows the number 7 (in honor of the "Original Seven" astronauts) inside of the astronomical symbol for the planet Mercury. Underneath the slab is a time capsule that contains artifacts related to Project Mercury, including photos, film footage, capsule blueprints, and even John Glenn's Marine Corps pilot's wings. It is scheduled to be opened in the year 2464. Complex 14 was built in the late 1950's to support Atlas launches. Up until its deactivation in February of 1967, it supported a total of 32 Atlas and Atlas-Agena launches. These included four manned launches for the Mercury program, and seven unmanned launches for the Gemini program. After years of exposure to the weather and salt air, the service structure and launch stand were razed in December of 1976. Complex 14 was added to the National Register of Historic Places on April 16, 1984.